Haida canoes were exquisite craft hewn from the gigantic red cedar that grows on Haida Gwaii and were highly prized by chiefs of other nations throughout the coast. The combination of beautiful lines that pleased the most demanding navigator with the fine craftsmanship and the superior quality of the cedar available on Haida Gwaii literally made Haida canoes the Cadillacs of the coast. Canoemakers in each village worked on their new craft throughout the autumn at sites where the very best red cedars stood. After an appropriate snowfall that facilitated sledding, the roughed-out canoes were moved from the woods to the nearest beach and towed to the home village, where they were finished over the winter. In the spring, lightly manned flotillas of new canoes left Skidegate Inlet, Masset and Rose Spit on the north coast, braving the seasonal storms to head for the mainland. If these vessels could withstand a crossing of the treacherous Hecate Strait, they could withstand any weather the coast could provide. At the Nass River, the canoes were traded to coastal tribes assembled to take advantage of the spring eulachon fishery. Old canoes were taken in trade by the Haida for their return journey home. When the first Europeans arrived, they made drawings depicting the Haida in their large war canoes with high prows emblazoned with the crests of the owners. Although there are many models of these canoes, called "head canoes", no full-sized ones have been preserved. A model of an ancient style of war canoe, often called a "head canoe," whose broad prow was designed to display the crests of the chief who owned it. This type of canoe had disappeared from use by the middle of the nineteenth century, although models were still made after that date. Collected on Haida Gwaii (probably at Masset) before 1892 by Edward Harris, a Hudson's Bay Company fur trader. By the end of the eighteenth century, the Haida had learned from visiting sailors and sea captains how to rig sails, and thereafter most large canoes were fitted with two or three masts and sails of canvas or cedar bark mats. These faster, more manoeuvrable craft were capable of carrying 20 000 kg (10 tons) of freight. The development of this new craft was probably responsible for the disappearance of the "head" type of canoe. The head canoe had a massive prow extending far in front of the canoe, which was ideal for bearing the crests of the war chief but was a detriment to manoeuvrability under sail. Models of head canoes continued to be made until they began to fade in the memories of carvers. 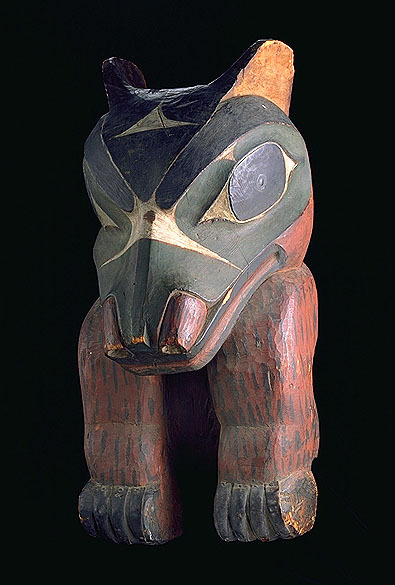 A Bear crest from the prow of a Haida war canoe. Such figures were added for ceremonial occasions and removed when the canoe had to be stripped for battle. Collected on Haida Gwaii in 1879 by Israel W. Powell. War canoes had the same sharp projecting prow as the freight canoes but, in addition to the two-dimensional painted designs on the hull, they often had separate carved crests at the bow or stern. A stunning example of this style of war canoe was made by Alfred Davidson and other master canoemakers (including Robert Davidson Sr., Robert Davidson's grandfather) for a world's fair in the United States. The paintings on it were designed and executed by Charles Edenshaw. When the final price proved too high for the fair's budget, the craft was purchased for the Canadian Museum of Civilization. At 17 m (56 feet) in length, this is the largest Haida war canoe that has survived (although the Heiltsuk war canoe at the American Museum of Natural History in New York is considerably longer). 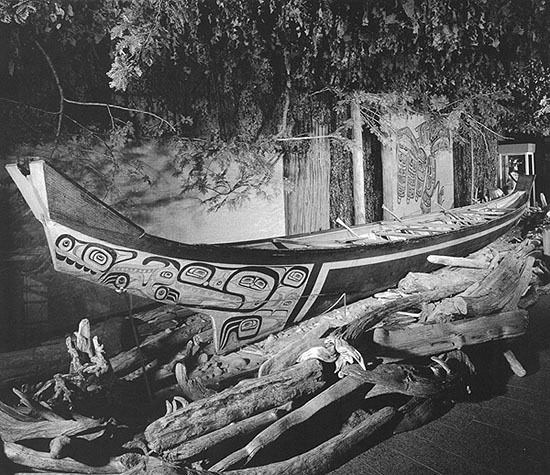 The only surviving Haida war canoe, 17 m (56 feet) in length with a beam of nearly 2 m (6 feet). It was commissioned for the 1904 Seattle world's fair from Alfred Davidson and other Masset carvers, including Robert Davidson Sr. The original paddles were lost en route to Ottawa, but Charles Edenshaw made a replacement set. Collected at Masset in 1908 by Reverend William Hogan and R. W. Brock. 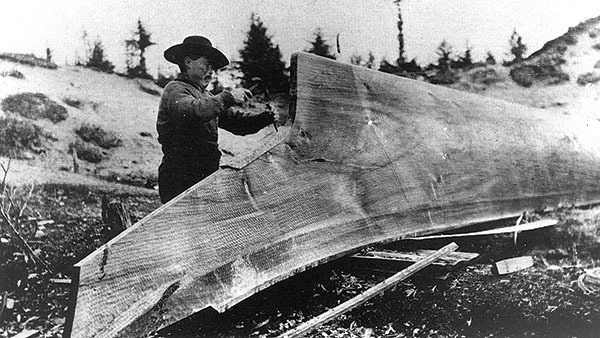 Alfred Davidson of Masset, shown carving the canoe that was commissioned for the 1904 Seattle world's fair. It was painted with Sea Wolf designs by Charles Edenshaw and is now on display at the Canadian Museum of Civilization. Photograph by Edward Sapir, 1914. In 1985, Bill Reid was commissioned to make a 15-m (50-foot) dugout canoe for Expo 86, the world's fair in Vancouver. This beautiful craft he called Lootaas (or Wave Eater). After the fair, several replicas were made in fiberglass, the first two of which were for the Canadian Museum of Civilization. The original canoe was taken to France and paddled up the Seine to Paris, in honour of the bicentennial of the French Revolution. Later, it undertook a much-publicized voyage from Vancouver to Haida Gwaii and has since been kept at Skidegate for ceremonial occasions.